Sam Worthington delivers thrills from the 25th floor in Man on a Ledge. 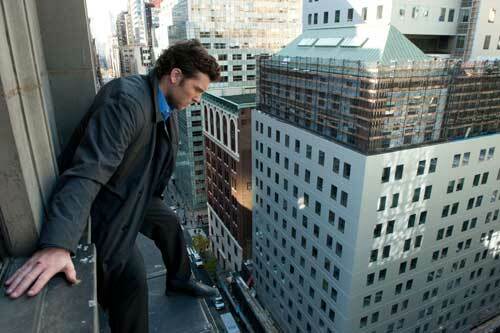 A man on a ledge is the focal point of the action-thriller film Man on a Ledge. The man in question is Nick Cassidy (Sam Worthington, The Debt), a former cop who has been framed for the theft of a rare, prized diamond. Recently escaped from prison and with nowhere else to go, Nick climbs onto the ledge of a towering skyscraper, inviting the eyes of New York City to anxiously watch as one wrong step could mean plunging to his death. But as one police negotiator (Elizabeth Banks, Our Idiot Brother) soon learns, Nick’s daredevil stunt, captivating the eyes of the public and media, masks a dangerous ploy to reveal the truth about his tarnished name. With the help of his brother (Jamie Bell, Jane Eyre) Nick sets his intricate plan into motion while perched high atop the 25th floor ledge of a Manhattan tower. Directed by Asger Leth, Man on a Ledge co-stars Ed Harris (The Way Back), Anthony Mackie (Real Steel) and beautiful Genesis Rodriguez (Casa de mi Padre), who offers a notably gratuitous scene clad only in her underwear. Released wide to U.S. theaters in Janurary, 2012, the PG-13-rated Man on a Ledge received generally positive reviews but rang up only a tepid $19 million at the domestic box office. Bonus features on the DVD and Blu-ray include a featurette and a trailer with commentary by Elizabeth Banks.